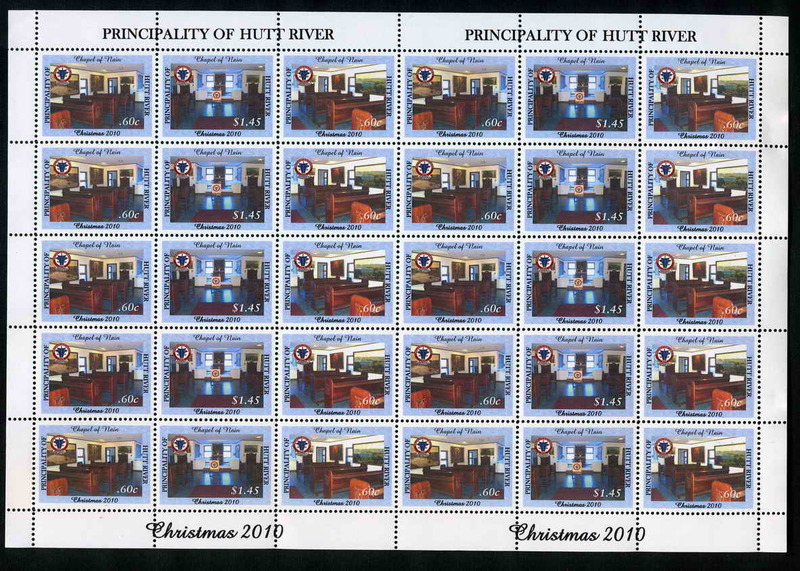 the issue of its set of 3 Christmas 2010 Postage Stamps on 01 December 2010. 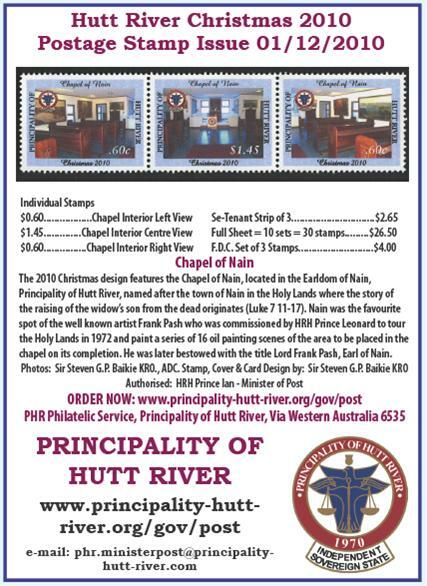 This year's issue, in keeping with the 40th anniversary year of the Principality, consists of three stamps featuring internal views taken from the entry door of one of the most visited buildings in Nain, which was also one of the first buildings commissioned for construction following the secession from the Commonwealth of Australia. 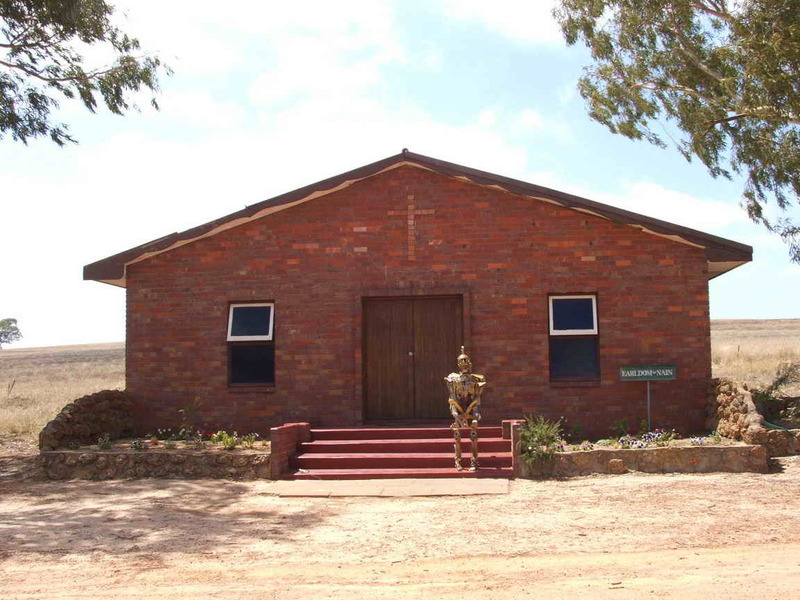 The Chapel of Nain, located in the Earldom of Nain, Principality of Hutt River is named after the village of Nain in the Holy Lands where the story of the raising of the Widow’s Son from the dead originates (Luke 7 v11-17). 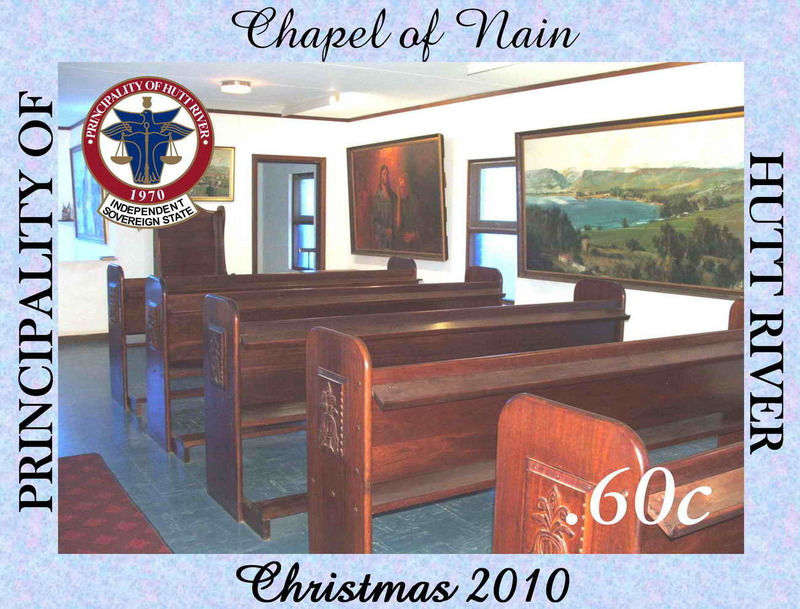 Nain was the favourite spot of the well known artist Frank Pash who was commissioned by HRH Prince Leonard to visit the Holy Lands in 1971 and paint a series of 16 oil painting scenes of the area to be placed in the chapel on its completion. Frank Pash was bestowed with the Title of Earl of Nain Lord Frank Pash, for his support of HRH Prince Leonard and the Province as well as his creative and outstanding artistry in creating the 16 Christian Religious works he was commissioned to produce that are displayed in the Chapel where they remain to this day. 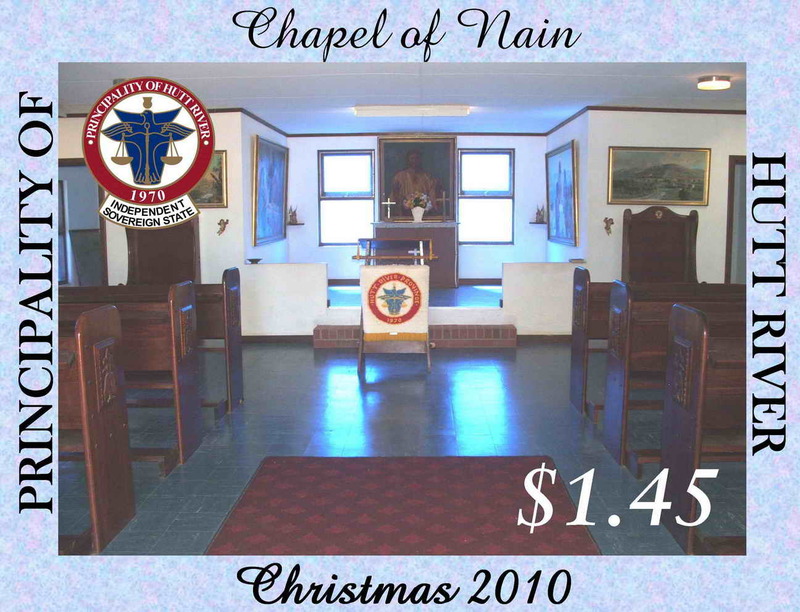 It was for this reason that the Chapel was also given the location of the Earldom Of Nain. A point of interest to note regarding these artworks is the fact that every face featured in the paintings is that of a person who was in the Province at the time of painting; everyone from visitors and TV crews to members of the Royal Family of Hutt may be recognised in the paintings. 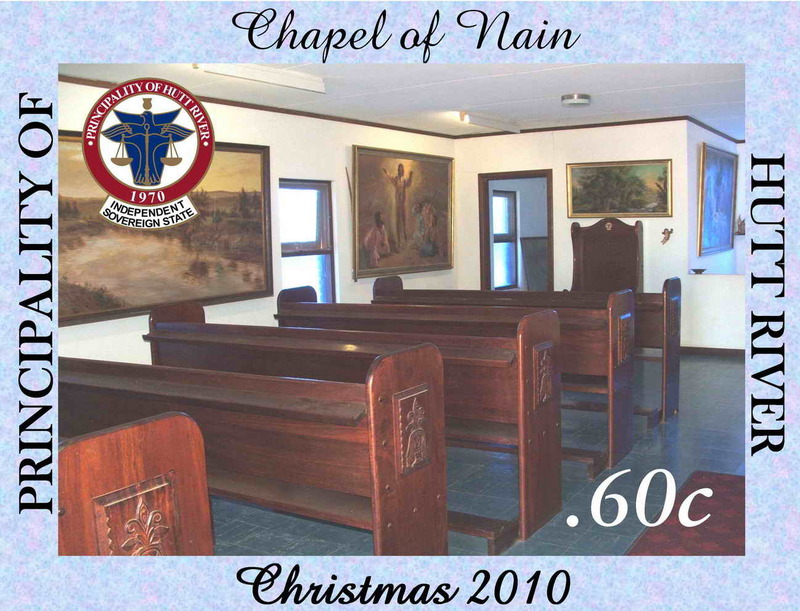 The Chapel was one of the first buildings erected in the Hutt River Province Principality (as it was known at the time) and was dedicated by a service on the 29th August1973 officiated by representatives of the Jewish, Anglican, Presbyterian & Catholic Churches. The key to the doors was handed to HRH Prince Leonard by his granddaughter Georgina Casley and HRH then opened the doors on behalf of the then Province to all visitors present and all who would come in the future to have uninhibited entry to the Chapel whatever faith or creed. Some of those officiating or present for the dedication were Rabbi Coleman, Chief Rabbi of Western Australia, Reverend Catley Rector of the Northampton Anglican Church, though it belongs to no faith or doctrine but rather to the Spirit. A crowd of approx 700 was present for this opening and dedication ceremony. It should be noted that Reverend Gordon Williams a former Rector of the Northampton Anglican Church and at the time Rector at Dampier was to have taken part in the dedication ceremony. However, being qualified to render first aid he duly stopped to provide assistance to those injured in a motor vehicle accident he came upon near the turn-off into the Province and was thus delayed considerably in his arrival. He was however able to participate in the celebrations following the opening. Following the dedication, the Sovereign Prince and Princess occupied the Royal chairs as two of their four sons Prince Ian and Prince Wayne participated in the first Christian ceremony that saw Reverend Catley Christen infant Rosanne Joy Casley, the first native-born citizen of the Province. A major feature of the Chapel is its windows made of specially imported Belgian Ripple finished “Blue Glass” used in order to reduce heat and ultra-violet light from entering and destroying the contents. A feature of the Chapel donated in time for the opening ceremony of the Chapel was a polished metal cross donated by Mr & Mrs S.E. Butler of Palmyra Western Australia. HRH Princess Shirley's parents. Unadorned and plain in design it remains in place today, standing on the Altar where it was first placed all of those years ago. It is interesting to note that this cross has been stolen from the Chapel on two occasions, both occasions it was returned anonymously! It is interesting to note that the builders who constructed the chapel included a team of carpenters and one of these men, Mr Clem Woods a cabinet maker, remained behind once the initial construction was finished and enlisted the family of HRH Prince Leonard to assist him in hand crafting and creating all of the furnishings. including the pews which provide seating for approx 60 people and the Royal Chairs, that are still in use in the Chapel today. Clem was also a horse breaker and broke a number of horses that were in the Principality at that time and he remained a close friend of PHR. The carpet visible in the centre of the main isle is a piece of the carpet from Windsor Castle in the UK. Following the devastating fire that went through a section of it in.1992, surviving sections of the main carpet were sold off in order to raise funds to help in the restoration of the fire damaged Castle. 5 rows of 2 sets of three stamps as se-tenants. Only 4,000 full sets printed. 400 sheets, each sheet made up of 10 sets of 3 stamps. Photos: Sir Steven G.P. Baikie KRO., ADC.